The road to a high-definition version of Final Fantasy XII has been a long one but it’s finally here. Square Enix’s release of Final Fantasy XII: The Zodiac Age brings the modern classic to a new era and with it, perhaps a chance for redemption in the eyes of fans who may have passed it up the first time around. Getting right into it, The Zodiac Age is a hefty package for the price. 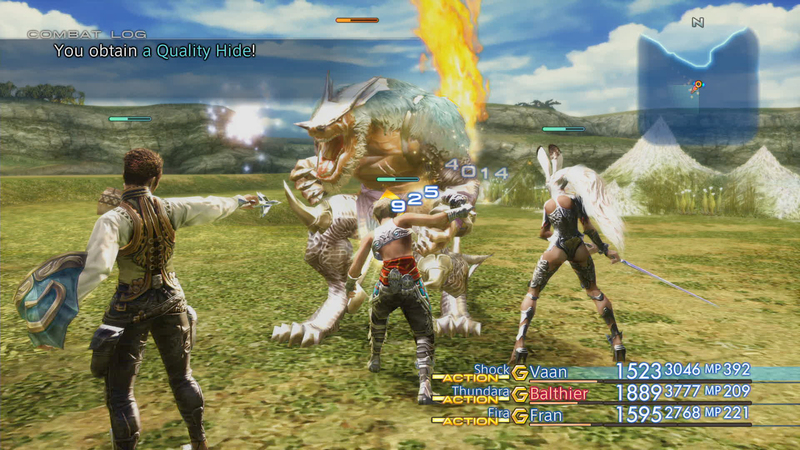 For the first time, Western players are introduced to 2007’s International Zodiac Job System version of the game – a re-release that saw a number of additions and improvements when it launched on the PlayStation 2. The Job System adds a collection of twelve different roles to choose from, with each character capable of rolling up to two jobs during the course of the game. Jobs familiar to the Final Fantasy pantheon such as White Mage, Knight, Machinist, Monk, Black Mage are all here and each have their own license board – drifting far from the original’s concepts of shared abilities. For example, the Bushi job class uses katanas and stays strict to light physical attacks while the the Red Battlemage has a diverse number of status element-based magical spells at their disposal. Once you choose a job for each character, you’re locked in so be sure to choose wisely. The Zodiac Age also brings several features to the table – many of which enhance the gameplay experience for both old and new players alike. Two of the best additions include an enhanced map feature and speed mode. The enhanced map throws up a transparent overly of itself by simply pressing R3, negating the need to navigate to the menu every time you wish to view your location. By pressing L1 you can activate speed mode, which dials up your characters’ movement speed by quite a bit. These features in particular make traversing terrain and dungeons all the more convenient. Another highlight available in The Zodiac Age is a separate Trial Mode of sorts. Here you’ll take your party and fight through 100 floors using a number of tactics and abilities along the way. The kicker is you can bring items obtained from here into the main game so for those looking for a challenge or more loot, Trial Mode should be right up your alley. The meat of the game comes in various other improvements typical of a HD remaster. Revamped visuals bring forth updated textures, advanced lighting and other effects benefited from the PlayStation 4 hardware. Quite honestly, The Zodiac Age represents one of the most solid remasters to date. It’s easy to see where the original’s focus on art direction and textures over polygons carried over and allowed the game to shine in today’s world of hyper-realism. The presentation is further boosted by high quality audio – the likes of which paints a stark contrast to the original’s muffled voice work. The Zodiac Age offers up a massive improvement, boasting clearer voice quality, sound effects and music. The music itself has seen a change as well with the option to switch between the classic score and a fully orchestrated version exclusive to the remaster. Other gameplay ticks of note include modern sensibilities such as auto-saving, faster load times and the ability to control guest party members and summons. The Zodiac Age is truly the definitive version in every sense. As for the game itself, it’s every bit of a joy that I remember. Moving away from turn-based battled into a more dynamic-but-not-quite action RPG system, FFXII is a very technical game in every sense of the word. You’ll find yourself messing about in menus to set up the game’s Gambit System – a set of commands you can “program” for each party member action. It’s these MMORPG sensibilities that allow for a complex, but at the same time, streamlined battle experience. Of course, you’re not beholden to these. You can also manually select your actions and targets in the menu normally if you so wish. Slight downsides come from the lack of shared party EXP gain and guest characters lacking the amount of oomph they had previously. The story is a more subjective affair. While The Zodiac Age doesn’t present new story content, it remains a story somewhat a-typical of the Final Fantasy series. Here you’re taking more of a back seat as you join Ashe, the orphaned princess of Dalmasca, as she struggles to return freedom to her homeland. It’s a more mature story – devoid of the typical melodrama found in a lot of RPGs – and that’s part of its strengths. It’s just a shame that its strong start doesn’t fully make it to the end of the long journey. The narrative’s downfall, however, is made up by a solid localization. The voice cast remains some of the best in the series and the rest of the script is the absolute pinnacle of quality yet to be matched by its single-player predecessors. Regardless, if you shied away from the game before, this is the perfect opportunity to jump back in for another go at a well-crafted and beautiful single-player experience. I’ve always felt Final Fantasy XII was a game ahead of its time and The Zodiac Age proves in many ways it still is. Disclaimer: A PlayStation 4 (digital) version of Final Fantasy XII: The Zodiac Age was provided to Nova Crystallis by Square Enix for review. Posted in Final Fantasy XII, Headlines, Reviews. bought it….gonna start this evening! Good thing Nomura wasn’t involved, otherwise it would’ve been full of faggotry.